Figure 1-33. Free Recoil Velocity Before Unlocking. recoil velocity versus time for the period before the projectile leaves the muzzle. The curve so obtained is shown in fig. 1 —33 as the portion between t=0 and t = 0.00234 second. In order to plot the remainder of the curve, it is necessarv to determine the maximum velocity of free recoil and extrapolate the curve by the methods previously described. Actually the extrapolated curve will apply only until unlocking occurs, 0.001 second after the projectile leaves the muzzle. The dotted portion of the curve in fig. 1-33 after t=0.00334 second is used only for purposes of extrapolation and does not relate to the conditions of recoil. 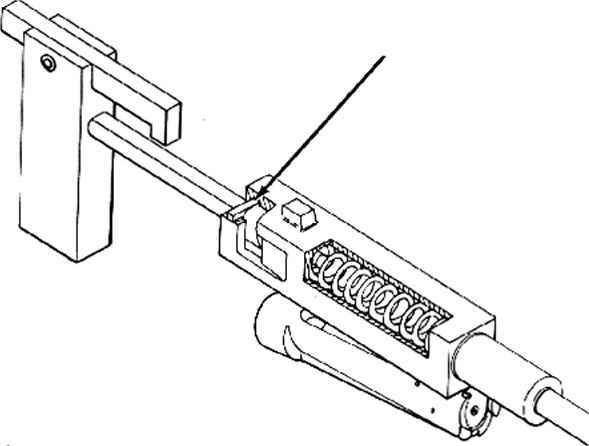 Immediately after unlocking, the rearward motion of the barrel is stopped by a buffer and the bolt is blown back by the residual pressure. Since the barrel is stopped by the buffer, the only real functions of the barrel spring are to assist the barrel to return to battery and to hold the barrel firmly in the battery position. Therefore the value of the forcc exerted by the barrel spring is not critical and the characteristics of the spring may be selected arbitrarily. To return the barrel quickly to battery, a fairly strong spring is desirable. As will appear, such a spring will not have any great effect on the recoil motion while the powder gas pressures are acting and therefore, the resistance of the spring can be made quite high. On this basis, the initial compression of the spring will be selected as 400 pounds and the spring constant as 400 pounds per inch. Sincc the bolt is light (10 pounds) and receives a relatively low impulse from blowback, the driving spring for the bolt will ncccssarilv be relatively light in order to permit the bolt to open the 10 inches assumed necessary for feeding a 20-mm round. The actual characteristics of the bolt spring can not be determined at this time but it can be safelv assumed that the bolt spring will have an initial compression of approximately 120 pounds and a spring constant of about 20 pounds per inch.